Condo, 2	Bedrooms, 2 Baths, Sleeps 6. Best Views in Town! You are going to have a blast at this 2 bedroom condo in the heart of Newport! This condo is right in the center of everything. 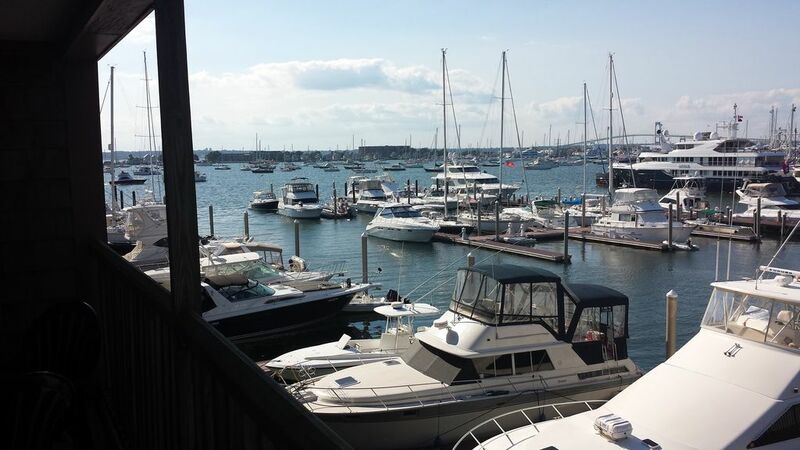 The Newport Onshore is an oasis of relaxation in the middle of Newport. Walk to everything, including grocery store, all the cute little shops, and restaurants of all price ranges. If you have never been to Newport in the summer, you don't know how important it is to have good parking available to you. The Newport Onshore is great because once you have parked your car you can walk almost everywhere. And because you have your own parking space, if you do want to drive to the casino or the State Park to check out the kite festival, your spot will be waiting for you when you get back. The views from this unit are incredible. Two balconies overlook the Harbor. Enjoy a glass of wine or a beer while watching the twinkling lights of the Newport Bridge from the balcony. Because this building extends out into the bay, you will find multi-million dollar yachts in front of you. You will be staying in a fully-furnished 2 bedroom/2 bath unit. My family loves it when we come. We pack light, because there is a washer and dryer in the room. We love making breakfast in the kitchen and sitting out on the deck watching the boats and the seagulls in the morning. We love to do the same thing at night as things wind down. If you prefer, there are DOZENS of restaurants within walking distance. Also an easy walk to many attractions, including the Newport Tennis Hall of Fame. My better half loves tennis, and when we bring friends we book some court time on one of their beautiful grass courts. If you have never been to Newport and Jamestown in the summer, you are in for a treat. Newport is alive with events, and Jamestown can be a quiet refuge. One key thing to note is that parking and traffic can be tough, especially on the weekends. That's another thing which makes this resort great. Because it's centrally located, you leave your car in your assigned parking space and rarely have to use it, unless you want to go to one of the nearby casinos, or carry your golf clubs. table, a living room, a full kitchen including four burner stove, oven, microwave, and dishwasher. Of course, there is cable tv with HBO in every room. DVD player in living room. On a cool evening, add a little ambiance and light a fire in the working fireplace. Units are the best equipped in Newport, including stove, microwave, dishwasher, etc. Don't pack a lot of stuff, because there are washers and dryers right in the unit! And air conditioning is ice cold! Indoor and outdoor pools on site, along with exercise equipment and sauna. Gas barbecues are also on site and are free to use. including the on site pools, the nearby beaches, the kite festival at the local state park. Newport Casino (all electronic) within 15 minutes, and Foxwoods less than an hour away. I have been coming to Newport for nearly two decades. I purchased these timeshare weeks and used them for many years. Now with a wife and kids, we do lots of other things, and sometimes rent them out in the summer. I hope you have as much fun in Newport as we do! In my opinion, the Newport Onshore is the best situated of all the resorts because of its views, and its proximity to everything. Some of the other resorts in town are either too far from the center, or they don't have the views which make you really feel like you are in a seaside town. Besides the great views, the pools, and the location in the heart of all the great restaurants and shops, it's great to be able to know that you are staying in a professionally managed resort, with "real" guest services, maintenance, housekeeping, and not running the risk of some AirBnB which might not deliver such consistent quality. toilet, tub, shower, Can enter privately from guest bedroom or from living room. Located on Thames Street, you are in the heart of the Newport action. View the Narragansett Bay and the Newport Bay Bridge right from your living room and deck. Gorgeous yachts parked steps away. See an occasional cruise ship as well. Clean linens on all beds. Additional linens provided for pull-out couch. There is a working fireplace with a starter log provided. Of course. Provided at no charge. Obtain the password at check-in. Treadmill, elliptical, free weights, sauna. Living room has a couch and two armchairs, coffee table, side tables, and of course a TV with cable, DVD, etc. Full-size fridge and freezer has an automatic icemaker. All that you need is right there. Full set of china, cutlery, pots, pans, etc. There is a lovely table which seats six. There are also two decks/balconies which have tables and chairs on them. We prefer to eat on one of the two decks overlooking the water. In all bedrooms and living room. The resort has videos available. There is a RedBox for $1.25 per night rentals at the local Stop & Shop. I can't say enough about the TWO balconies which overlook the harbor. Check out the photos and the videos. One of the balconies has a table and chairs for outdoor dining (see video). Patio by the pool. Decks/balconies are accessed via sliding glass doors from living room and kitchen. Newport Tennis Hall of Fame is up the street. Play tennis on their grass courts! This unit has two bedrooms, two bathrooms, a dining area with a dining room table, a living room, a full kitchen including four burner stove, oven, microwave, and dishwasher. Of course, there is cable tv with HBO in every room. DVD player in living room. On a cool evening, add a little ambiance and light a fire in the working fireplace. Units are the best equipped in the area, including stove, microwave, dishwasher, etc. Don't pack a lot of stuff, because there are washers and dryers right in the unit! And air conditioning is ice cold! Indoor and outdoor pools on site, along with exercise equipment and sauna. Barbecues are also on site and are free to use. You will be staying in Unit 131 in the Westwind Building. This is my specific unit. You will get the views shown, not some interior unit as if you were renting from some big company or agency. We enjoyed our recent stay in Newport. Fred's condo is top of the line, with the most breathtaking views of the boats from the terrace. The only complaint was one weekend night, there was a party right outside our bedroom and it kept us up most of the night (and the air was on, so the windows were closed...that's how loud it was). Other than that, we loved our stay at the Onshore. Both pools were great and my kids loved the salt water. Condo is centrally located and restaurants and shops were a short walking distance away. Great vacation! We absolutely loved this property! The location was perfect. The view from the deck was wonderful, we spent all of our time out there! Much larger than the pictures show. We would definitely stay here again! This is a great condo in the middle of the Lower Thames area in Newport. You can truly walk almost anywhere and while it's close to the action, it's a slightly less crowded part of town. Spent many hours sitting on the deck watching the harbor and the amazing yachts come and go, and the sunset was spectacular. No problems with parking, the apartment is well stocked and comfortable. Excellent beds, two large bathrooms, comfortable and convenient. Very simple to check in and out. There were some very loud parties on the weekend - there is a loud band that plays late on weekend nights a couple of wharves down, almost directly across from us. Weather was nice so we had the windows open; when we shut the windows for the a/c it wasn't as noisy. If the pool area is important to you, the place could either use some more pool chairs, or restrict people from reserving them early on with towels (and then only using them for a couple of hours). Would highly recommend this condo. Thanks so much for your excellent review. I was at another resort in Newport the same weekend as your stay, and it was really hot that weekend. I don't think many people wanted to venture out and see Newport that day, and everybody stayed near the pool! I'm glad you enjoyed your stay, and spent some time taking advantage of the great views from this unit. This was my families second time to the Onshore and I cannot thank you enough for following through with my reservation confusion. The views from the Westwind untits are the best and my family and I truly enjoyed every minute of our time down in Newport. We love the fact that since we were centrally located that we could just walk anywhere at anytime. I would highly recommend this unit to anyone who is looking for comfort, closeness to town and beautiful views. Thank you. I'm glad you had a nice stay! I do love being in the Westwind building, with what are unarguably the best views at the resort. Casino (all electronic) within 15 minutes, and Foxwoods less than an hour away. Golf Course is just a few minutes away as well..
Weekly Rate: $2000 Please read the whole ad. This courtesy allows me to respond to serious requests quickly. Please do not inquire about renting for other weeks. At the Newport OnShore I have onky 1 week left. Friday, July 12 -Friday, July 19, 2019 Friday, August 9 -Friday, August July 16, 2019 Friday, August 16 -Friday, August July 23, 2019 Please DO NOT SEND INQUIRIES FOR OTHER DATES.